Tropical Cyclone Japhet (19S) is shown in these true-color Terra and Aqua MODIS images. 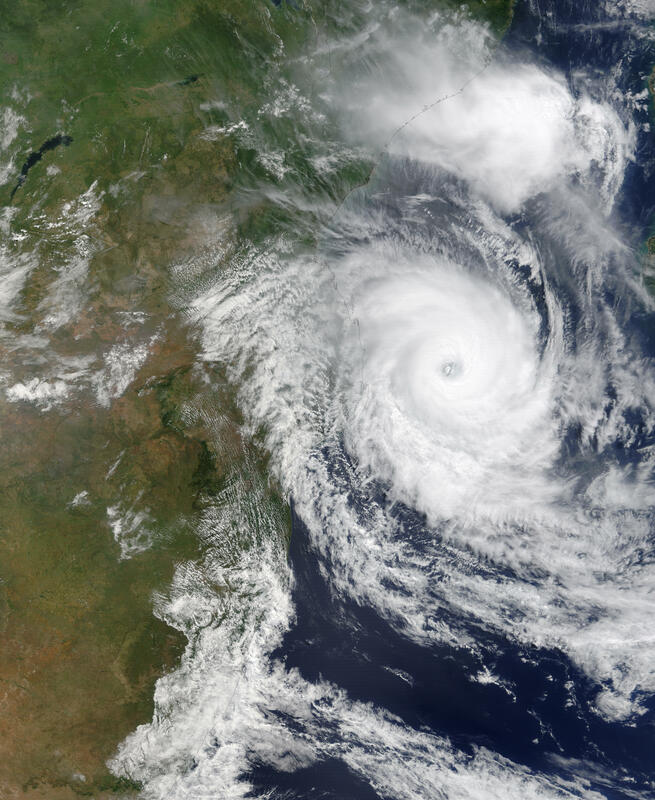 On Feb. 26, the storm is swirling in between Mozambique, on the left, and the island nation of Madagascar on February 26, 2003. When the first image was acquired, this storm was relatively young, though it was expected to grow into Category 1 cyclone (with 75 knot/86 mph winds). At the time this image was acquired, Japhet was a Tropical Storm with 35-knot winds, which is just above the threshold for being considered a Tropical Depression, the lowest level, organized-storm system category. One interesting feature of Japhet is that it was expected to move very little over the course of its life: less than 2 degrees latitudinally and just over 6 degrees longitudinally toward the Mozambique coast.